Size : 32HP. Current: +12V = 250mA. -12V = 80mA. Radikal Technologies, best known for the Spectralis 2 synth/sampler/sequencer, have entered Eurorack with a distinctive range of modules. From the outset, it’s clear these are based on a different design aesthetic to many Eurorack manufacturers; the RT-311 is very substantial, with large, firm-feeling knobs plus a ring of multi-coloured LEDs you instinctively know will provide hours of mesmerising motion. So once you’ve joined the two circuit boards together (a video is available online if guidance is required), it’s time to get radical. 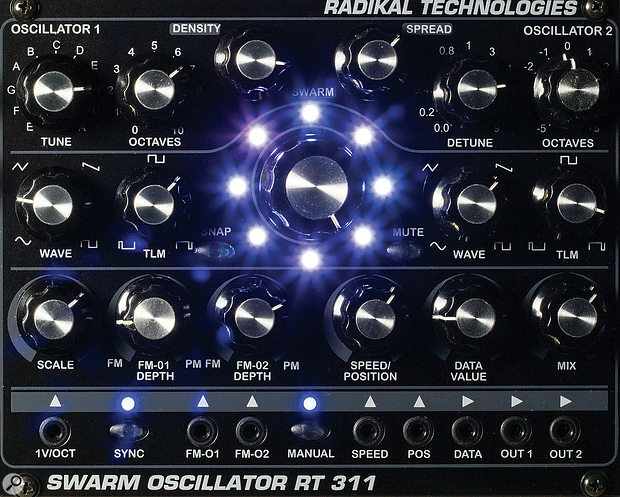 The RT-311 is a DSP-based dual oscillator, with each oscillator capable of spawning up to seven detuned copies of itself — hence the ‘swarm’ moniker. The oscillators have separate controls for waveform and pitch, plus distinct audio outputs, but a quick glance at the panel implies there’s only a single 1V/oct input. Here’s where you’ll need to download the manual, a jolly read, if not yet fully comprehensive (in its English incarnation anyway). It transpires that the two FM inputs can each handle 1V/oct, and in discovering this, you also realise that many of the controls are bipolar, featuring a central zero point, although there’s no physical detent. Generally, when adjusting values, the central ring of LEDs acts as a temporary display, which is surprisingly helpful in many cases. The manual also establishes several important principles. Firstly, the module has two main operating modes, plus a couple of edit modes and a small pool of memories for favourite creations. Navigation involves buttons at the lower end of the module, with the Mode/Shift button serving as focal point for switching, and LED colour representing the current mode. For example, green denotes Manual mode, where all the controls are live and instantly tweakable. Each oscillator has a continuously adjustable waveform and a variation on pulse-width adjustment named TLM (Time Linearity Modulation) that is applicable to all waveforms. Here’s where a second principle comes in: hold down Mode/Shift while adjusting any control and its output is quantised. In the case of waveforms, this yields exact sine, triangle, saw or square waves. And when using the Octave knob, you can quickly access full octave jumps rather than make the otherwise continuous pitch sweep across the full audio spectrum. This being a digital oscillator, it’s perhaps a shame there aren’t more exotic waveforms to play with, but to get started, I picked a sawtooth, chose C as my root note and a TLM value that sounded fat and full. Then I took a snapshot of this by hitting the ‘snap’ button. This was no random act because snapshots are a vital component of the second, more interesting, mode of operation — Interpolator mode. You can store up to eight snapshots of oscillator parameters, making each a gradual progression from the last or completely different as the mood takes you. When you enter Interpolator mode, it’s snapshot animation that kicks the RT-311 into life. Animation involves circular or pendulum motion around some or all of the circle of snapshots and it’s driven either by the internal LFO or an external clock or CV source. The animation may be stepped or processed (interpolated) and the former is often a neat way of avoiding cheesy pitch transitions, which can occur when your oscillator snapshots include large pitch changes. Interpolation is a fascinating tool for generating new values from between any two active snapshots. For extra variety, you can temporarily mute one or more of these, effectively shuffling the interpolation process and producing fresh transitions. Plus, if all the gradual shifts are just a little too subtle, cranking the LFO to ‘crazily fast’, turns the transitions into strange, shimmering tones not easily replicated by other means. When offered conventional roles, the RT-311 is no slouch either. It’s equipped with oscillator sync and features normalised cross-modulation from those two bipolar FM/PM depth knobs. Naturally, these can be overridden by plugging in an external modulation source, a somewhat rare opportunity because external modulation is not widely catered for. As you can see from the panel, there’s a real lack of dedicated CV inputs, so you’re denied simple, direct modulation of fun parameters such as TLM, density, detune and so on, except by using animation. Even before you call upon the extra voices, these are sweet-sounding and versatile oscillators. Ultimately, though, it’s the swarm functionality that sets them apart from many others. Adding up to seven oscillators will take you all the way from buzzing clusters of detuned notes to regular chords, passing lush and magical somewhere on the way. By combining Shift and the Density control, you gain access to a preset collection of major or minor chords. Although these aren’t listed in the manual, it’s a simple matter to select one by ear, adjust the number of notes if necessary (too many and you could be accused of jazz), and store the chord into a snapshot. It’s no stretch to realise that snapshot animation then becomes chord automation. Pretty soon I’d created a convincing Philip Glass-style organ part, using an external sequencer to drive the animation position, and thus the chord changes. You can store eight memories in total; complete collections of eight snapshots ready for transmission to another module, or to record as an audio file for archive purposes. Editing parameters within a snapshot is possible too, but the manual rightly points out it’s best to be diligent when saving initially. If you need to go through all your snapshots to fix a single, carelessly-stored parameter, it’s a bit of a drag. Another option worthy of note is the scale correction at the CV input, even though in practice this seemed to be more of a scale filter than corrector. Finally, the module includes a feature I didn’t appreciate at first: data output. This is a free voltage that may be assigned in each snapshot and sent from the output jack. Obvious applications include the pairing of specific oscillator settings with exact filter cutoff frequencies, but there are countless other possibilities. The Swarm Oscillator’s size and price tag might deter the casual ‘bling buyer’ drawn to the moving circle of coloured LEDs like a nerdy moth. Fortunately, it is also a great-sounding dual oscillator capable of simulating up to 16 in detune or chord modes. It therefore covers a range from thin and pipey to thick and obese, but it’s when you engage animation that things really take off. Animation is a source of value switches or morphs, resulting in tonal changes, chord sequences, gnarly cross-modulation patterns or all kinds of madness from the space between snapshots. While I did occasionally wish to break away from the animator and felt more CV inputs were needed, this is nevertheless a continuously fascinating and flexible sound source, one from which I’ve already harvested a pile of freaky loops. I like it a lot.